Did you know in the early days of America's settlement the Irish were considered the least valuable members of society? In those days, building canals, bridges and the like were considered among the most dangerous and deadly of jobs. So only the Irish were hired for those jobs, because the loss of a few Irish was considered a blessing. In fact, THAT is the route of the famous St. Patricks Day parades throughout the world. It was the Irish Society of Boston that organized the first St Patricks Day parade in 1737 - not as celebration but as a political statement about how unhappy they were with their low social status and inability to get jobs here in America. How far we've come that something that started as a protest and political outcry would become a celebration, not just in the US but throughout the world. 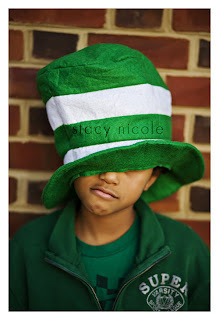 I look at our modern day St. Patricks Day festivities as celebration of how our society has evolved, how our civil rights have grown. Back then, no one wanted to be Irish or they may be doomed to poverty. Now, on St. Patricks Day everyone claims to have a bit of Irish in them! That change in attitude is something to celebrate! God Bless America! May your heart be as light as a song, that stay with you all year long. For today and every day!